This newsletter provides a summary of the most recent reports on the damage to Syria’s heritage. It should be stressed that much of this data cannot be verified, but it is hoped that it will assist in the documentation of the damage occurring, and help raise awareness. If the newsletter is not displaying properly, click here to view it online in a browser. Images of damage to the visitor’s centre at Dura Europos were published by the DGAM on December 29 and December 30 2014 here and here. 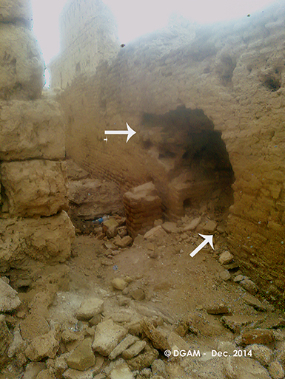 On December 28 the DGAM published new photos of damage to Dura Europos, primarily the excavation house, here. On December 25 the DGAM also reported further damage (caused by illegal digging) to the well-known Temple of Bel at Dura, here. Photos show the damage to the Catholic Armenian Church shared by Aleppo Archaeology (January 15 2015) here. Report on the state of the Museum of Education in Arabic, shared by Protect Syrian Archaeology (video 4.48 min) shows severe damage to the building (January 13 2015) here. New photos show the damage to Al-Hamandar Mosque in Old Aleppo, shared by Aleppo Archaeology (January 11 2015) here. Article (in Arabic) entitled, “The Saraial Building from a historic palace to an ISIS military base to a graveyard of 50 prisoners” shows two pictures of damage to Al-Bab Saraial building, Al-Bab-Aleppo. Halab News website, (January 3 2015) here. 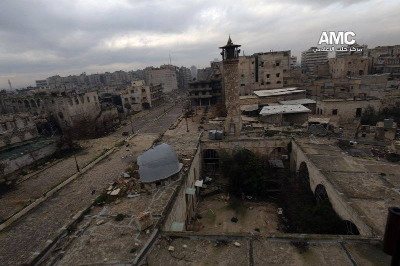 New Photos show the destruction of Old Aleppo City, shared by Eyes on Heritage (January 5 2015) here. Video shows the damage to Al-Sarwey/El-Sarwi Mosque, Al-Bayadda-Aleppo City (Halab News, January 3 2014) shared by Mosques of Old Aleppo here. Tunnel bombs have caused damage around the citadel in Old Aleppo, the DGAM reports (December 30, 2014) with a photo of the explosion here. Video shared by Protect Syrian Archaeology (December 19 2014) shows the state of the mosque and Madrasat al-Ferdous here. Agence France-Presse (January 7 2015) states that Al-Qaeda’s Syrian affiliate has destroyed the tomb of Imam Nawawi in Darra province, here though no photographs are shown. Photos by Hussain Qanaj show the damage to the Citadel of El-Mudiq/Al-Madeeq, Hama shared by Protect Syrian Archaeology (January 2 2015), here. Image shows the damage to Al-Rahma Mosque, Jobar- Damascus at night after being shelled by the Syrian Regime Forces, taken by Lens Young Dimashqi, (January 1 2015), here. The DGAM reports (January 15 2015) that illegal looting by organised, armed gangs with earth-moving equipment continues west of Deraa, here. Numerous Tells, including Tell Ashaari, have been targeted. An earlier update on looting at Tell Ashaari can be found here. On January 14 2015 the DGAM reported that Najim (Najam) castle, in the vicinity of Aleppo, has been subjected to further illegal looting by armed gangs ‘specializing in antiquities’ here. The site was previously heavily damaged by looting as reported earlier here. 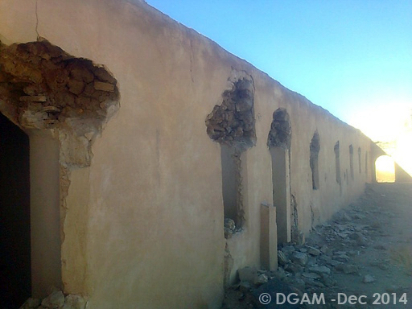 The DGAM reports (December 27, 2014) vandalism, quarrying by dynamite, and the occupation by militants of certain areas of the convent of St. Simeon, here. More illegal digging has taken place at Qalaat Rabha, near Mari, according to the DGAM (December 21 2014) here. The report notes the perilous state of many of the sites in the eastern part of the country. The DGAM is creating a searchable database of church icons, it reports on December 21 2014. In addition to providing a useful resource for researchers, it is also hoped that the database will assist with tracking stolen antiquities. For the full report, see here. The DGAM has provided a quarterly update on damage in Syria, for the period between October 1 and December 20 2014. Much of the list addresses damage around Aleppo, Idlib, and Hasakah. The DGAM notes that it has not been possible to gain easy access to sites around Raqqa because of the security situation. It expects further damage in these areas. See here for the document. The Americanthinker.com published an article (January 5 2015) about the damage that IS is inflicting on culture throughout the Middle East, including Syria, entitled ‘ISIS and the Decimation of Culture’ by Eileen F. Toplansky. The article provides numerous quotes about damage caused by looting of Syrian antiquities. Oped News (December 24, 2014) states that ‘Looting has become the greatest threat to our cultural heritage in Syria’ calling the current crisis the ‘worst patrimonial disaster since World War II’. Reuters reports on December 23 2014 that ‘Satellite images show 290 heritage sites in Syria damaged by war’ according to the UN. Copyright © 2015 Heritage for Peace, All rights reserved.